Assembly Time: We will assemble again this year at 48 West 48th Street, at 3:20 p.m. to more accurately reflect the time we may actually start marching. We are positioned in the line of march after County Carlow and ahead of County Wicklow. The 100th Anniversary of the Easter Rising: The centennial of the Easter Rising is being marked by the appointment of Senator George J. Mitchell as the Parade’s Grand Marshal. Senator Mitchell successfully brokered the Good Friday Agreement, gaining another major step in Ireland’s centuries-long quest for independence and freedom. Dress Code: The St. Patrick’s Day Committee has requested that we adhere to the following dress code: no sneakers, jeans, or inappropriate dress and head gear. 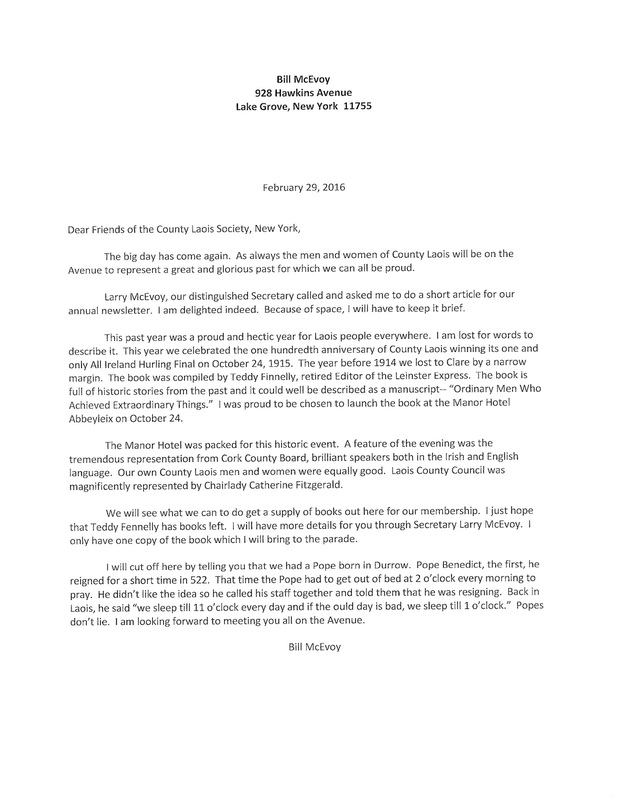 Bill McEvoy: We once again salute our senior Laois statesman, Bill McEvoy, who was a founding member and activist of Ceoltas Ceoltori na hEireann in the U.S. and Canada, and who now, at the ripe age of 93, assures us he will join us on Fifth Avenue on this historic St Patrick’s Day. Moreover, last October Bill journeyed to Abbeyleix to represent our Association at the celebrations for the 100thanniversary of Laois’s great win over Cork in the 1915 All-Ireland Senior Hurling Championship at Croke Park. 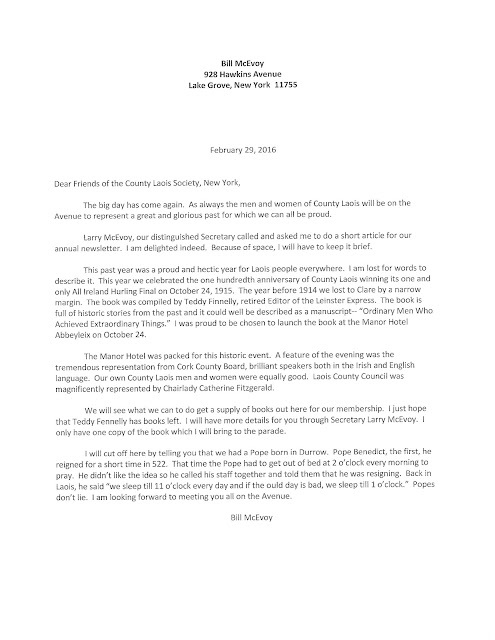 Please see Bill’s report of the event and the launching of a book for the occasion compiled by Teddy Fennelly, former Managing Editor of the Leinster Express, on our NY Laois Association Blog (below). We would also like to congratulate Bill and his wife, Lily, on their 66th wedding anniversary which they celebrated last month. Never known as one to throw in the towel, Bill is still writing, organizing, traveling, enjoying his nine children, 25 grandchildren, and almost 15 great-grandchildren, and naturally, playing in his own band. Tom Phelan: Congratulation to Mountmellick native Tom Phelan on publishing his sixth novel, Lies the Mushroom Pickers Told, during 2015. This July, he’ll see his acclaimed novel of Ireland in World War I, The Canal Bridge, released in paperback by Arcade Publishing. At the same time Tom is working on his memoirs, Working for JohnJoe, selections of which appear from time to time in the Irish Echo; “Dad Wasn’t a Dev Fan” was published last June and “To School with Uncle Jack and Red” a couple of weeks ago. Tom’s novels are available in hard copy and as ebooks. For more information, see www.tomphelan.net and www.facebook.com/tomphelannovels. Tom’s wife, Patricia Phelan, edits the award-winning Newsletter of the Irish Family History Forum (www.ifhf.org) and works as a professional genealogist specializing in Irish and U.S. family history. She has written a couple of articles on genealogy for the Irish Echo, including “Fact and Fiction in Family History” (Feb. 21, ‘06). She can be contacted at glanvil3@aol.com. Web and Blog sites  Laois Blog: www.nylaoisassociation.com for previous years’ photo galleries etc.  NYC Saint Patrick’s Day Parade website: www.nycstpatricksparade.org.